It may seem strange that I should add a review of a film that was released some 10 years ago in 1990, but as I'm talking about my favourite film of all time, The Russia House, it is only natural that I add a eulogy to this masterpiece on my web site.  It stars Sean Connery - top actor!  All the cast play their roles convincingly and brilliantly especially Michelle Pfeifer's portrayal of a Russian woman. But the film is greater than the sum of its parts, I love the dialogue which can be witty at times, I love the jazz influenced sound track, I love the scenery; but most of all I think that the film accurately portrays some idiosyncrasies of Russian attitudes and mannerisms as well as capturing the sense of fear that pervaded encounters between Russians and Westerners in Soviet times. John Le Carre intended that his novel be a kind of snapshot of the early days of Perestroika when the Soviet Union was becoming a more open and freer society. The policies of Glasnost and Perestroika were yet more state doctrines, imposed from above. The general population was understandably apprehensive; there was no guarantee that thing would not go back to how they were, indeed the coup attempt in 1991 is testimony to the desire of some apparatchiks to turn back the clock. Both the book and the film manages to capture the mood of that period in the dying days of the cold war when the grey men on both sides wished to perpetuate the arms race. I have added two independent reviews of The Russia House as they can describe the film more eloquently than I can. Very often, movies can be too smart for their own good, but in "The Russia House," Fred Schepisi's exceptional film of the best-selling John le Carre espionage novel, intelligence is a stirring, scintillating virtue. The novel, which has been elegantly adapted by Tom Stoppard, makes a labyrinth out of the geopolitical status quo. In this world nothing can be known absolutely; everything is relative, shrouded in layer upon layer of lies, manipulations and disinformation. But Schepisi navigates the maze expertly, cleanly laying out the action so that we're drawn inside the puzzle. The movie challenges us to keep everything straight, as the very best thrillers do, and in the process makes putting together all the pieces its own heady pleasure. The events of the film turn on what could be a major leaking of secrets. A manuscript containing the Soviet military master plan falls into the hands of British intelligence. It could be "the pot of gold." Or it could be a shrewdly manufactured bundle of disinformation. The man who wrote it -- a renegade physicist calling himself Dante (Klaus Maria Brandauer) -- may be on the level, or he may be a KGB puppet trying to sucker the West into lowering its guard. Whatever turns out to be true, the CIA doesn't like it. The agency also isn't crazy about the fact that the man who was originally meant to receive the document -- a broken-down, boozy publisher by the name of Barley Blair (Sean Connery) -- makes frequent trips to the Soviet Union and may be what he says he is, a man who loves the Russian people, or a misguided peacenik or worse. At first Barley has no idea what's going on. The courier -- an editor for a Soviet publishing firm named Katya (Michelle Pfeiffer) -- was supposed to take the material to Barley, who had impressed Dante at a Soviet writers' conference. Instead she dropped it into the hands of a colleague, who passed it on to the British authorities. Dante had wanted Barley to publish his manuscript, but of course the intelligence communities in England and America won't allow that. Before they can determine what to do with it, though, they must determine whether it's true. And so Barley -- protesting all the way -- is sent back to Russia to make contact with Katya and, if all goes well, with Dante himself. Even with all these spider-webbed plot details to sort through, "The Russia House" is more character-centered than most spy thrillers. Much of the film's action, such as it is, takes the form of interrogations, and Schepisi has turned them into tense verbal chess matches. It helps, of course, that the actors play their pieces brilliantly. Connery's Barley is a malt-cured reprobate with hipster tendencies who's gone his own way without much in the way of responsibilities or, for that matter, achievements. Barley is a shambles, like his beloved Russia, but he's his very own shambles. When the spooks grill him, he knows he has nothing to lose and turns their questions back on them with hilarious panache. This may be the most complex character Connery has ever played, and without question it's one of his richest performances. Connery shows the melancholy behind Barley's pickled charm, all the wasted years and unkept promises. Barley isn't used to being taken seriously or depended on. What draws him, at first, into spying for the West is the chance it gives him to do something decent for a change. After he meets Katya, though, he has a second motive. Pfeiffer's Katya is the linchpin in the drama, the straight arrow whose moral authority anchors the events, and with a less gifted actress the character could be a humorless drone. What saves Pfeiffer is the shy girlishness that peeks out from behind Katya's brusque skepticism. Katya wants to be all business, a blank-faced pro, but she can't help but respond to Barley's wry gallantries. The romance between Katya and Barley doesn't follow the usual path. Their scenes are interrogations too. But beneath the business agenda, a subterranean seduction is taking place. Their romance is the biggest secret of all -- even perhaps to them -- and the tension between them, as they work on two channels at once, keeping their true feelings closeted from each other, is intoxicating. Surrounding the leads is a gang of first-rate supporting performers. As Dante, Brandauer has a touch of the poet about him. Both James Fox as Barley's British operator, and Roy Scheider as his American counterpart, are superb. But it's the director Ken Russell, as a member of the British team, who threatens to steal the show with his fey exuberance. Added to this, "The Russia House" has visual pleasures far beyond those of most thrillers. Some of this can be attributed to the heroic shots of Moscow and Leningrad (the film is the first American production to be shot inside the Soviet Union), but Schepisi and his longtime cinematographer, Ian Baker, also find imaginative ways to shoot even the most mundane settings. Making a picture about the political situation in a country as much in flux as the Soviet Union can be disastrous, but the post-glasnost realities here seem plausible and up to the minute. "The Russia House" doesn't sweep you off your feet; it works more insidiously than that, flying in under your radar. If it is like any of its characters, it's like Katya. It's reserved, careful to declare itself but full of potent surprises. It's one of the year's best films. The Russia House -- love story or post-Cold War spy story? Starring Sean Connery, Michelle Pfeiffer, and Klaus Maria Brandauer. 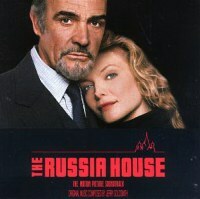 OF THE WINTER FILMS I've seen so far, the one which most remains with me is The Russia House, an adaptation of the 1988 John le Carr'e spy novel. This, unlike a Kindergarten Cop or Home Alone, is a film of subtleties. It is intelligent and rich, with a powerful sense of time and place. Indeed, time and place may be the most important attributes to this film, which covers the espionage business in the age of glasnost. It is pleasantly ironic that actor Sean Connery -- perhaps still better known as master spy "Bond, James Bond" -- returns to us as the novice spook Barley Blair. Blair is a second-rate man, not the shining star required for hard-core, high-risk intelligence operations. He is a washed-up British publisher whose favorite pastime is getting drunk in Portugal. But little does he know that some of his drunken rhetoric has inspired a top Soviet scientist to save his nation by betraying it. Through intermediary Katya (Michelle Pfeiffer), Blair is to confirm the authenticity of a set of notebooks with detailed accounts of Soviet technological weakness. The notebooks were written by a dissident Soviet scientist who took to heart some of Blair's semi-mindless ramblings (sometimes, Blair says to an attentive group of Soviets, to save your country, you must betray it). The scientist, code-named Dante (Klaus Maria Brandauer), hopes Blair will publish the notebooks, which would then conceivably promote nuclear disarmament. However, the notebooks never reach Blair. Instead, British intelligence and ultimately the Central Intelligence Agency acquire the documents, and decide to ask Blair to go to the Soviet Union and find out the identity of the as-yet-anonymous author. Their only lead is Katya, who gave the notebooks to one of Blair's publishing colleagues at a book fair in Moscow (after Blair failed to show up). Conceivably, the scene is set at this point for an action-thriller. But screenwriter Tom Stoppard and director Fred Schepisi focus not so much on the intricacies of the spy racket as on the increasingly anachronistic attitudes of the Western intelligence officers and the relationship which blossoms between Blair and Katya. An ethereal quality -- characterized by washed-out scenes of grey skies, quiet rides through the Russian countryside, and a gentle background of jazz -- further undermines the importance of the espionage plot. The heaviness typically associated with films of this genre has been lifted -- the Iron Curtain is gone. What has returned in its place is hope -- expressed most resonantly in Pfeiffer's character. Her blossoming is powerful enough to bring meaning for the first time in Blair's waning life. The espionage plot, in the end, becomes a backdrop for Katya and Blair's love story. The myriad characters associated with the British secret service and the CIA become almost comical with their concerns over the Soviet threat to Western freedom. The Soviet Union we see in this movie is a humble beast, crumbling beneath 70-plus years of its own heavy-handedness. Remarkably, in poking fun at the intelligence community, the film does not attempt a pretentious left-liberal political message. There is instead a simple honesty to the comical depiction of an entire profession suddenly rendered irrelevant by its own relentless dedication over the past 40 years. If there is any political message, it is that glasnost has done some good. It has given a sense of renewal to the Soviet people, a new hope. And by doing so, it has given new hope to the world. At the same time, the film also reminds us that while the reforms in the Soviet Union have unleashed powerful voices, little action has been taken to restore real political and economic freedom. Goods are in short supply, and fear remains. But the war of ideas is clearly over, and love is no longer merely an escape from brutal reality but an end to achieve in itself. This story was originally published on Wednesday, January 16, 1991. The story was printed on page 12.